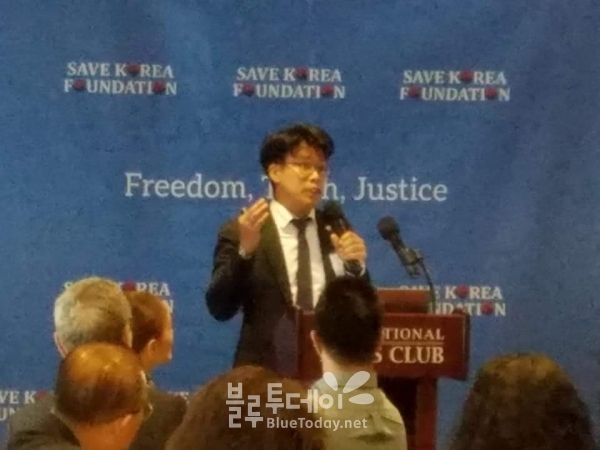 우파 성향 대학생·청년 단체인 트루스포럼(Truth Forum)은 12일 미국 워싱턴 D.C.에서 열린 비공개 모임에서 고든 창, 데이빗 맥스웰, 수잔 솔티, 로렌스 펙 등 한반도 전문가들을 만나 대한민국이 직면한 위협을 알리는 성명을 발표했다. 이날 트루스포럼 소속 조평세 박사는 “대한민국은 주사파 세력에 점령당한, 위험한 상황”이라며 “문재인 대통령은 청와대 비서실장을 비롯한 비서진의 많은 수를 주사파로 기용했고 북핵 문제가 심각한 상황임에도 불구하고 한미동맹에 균열을 내고 있다”고 밝혔다. 이어 “친북 좌파가 주도하는 언론 보도와는 달리 한미동맹을 훼손하고 있는 문재인 정권에 대해 많은 국민들이 분노하고 있으며, 대다수의 국민들은 강력한 한미동맹을 지지한다”고 말했다. 조 박사는 “우리는 이제 북한의 실제적인 변화를 끌어내야 한다. 고통당하는 북한 주민들을 해방해야 한다”며 “자유와 진리의 가치를 위해 함께 피 흘린 우리는 국제사회의 안녕과 북한의 변화를 위해 함께 나아가야 한다”고 역설했다. 끝으로 “대한민국에서는 감상적 민족주의에 빠진 사회주의자들이 지상 최악의 노예국가 북한을 옹호하고 자유민주주의와 시장경제를 위협하며 반미감정을 조장해 왔다”며 “과거의 행적과 현재 추진하는 정책들을 고려할 때 문재인 대통령과 집권 여당이 이런 사람들은 아닌지 심각하게 우려한다”고 했다. 서울대학교에서 처음 시작된 트루스포럼(Truth Forum)은 2017년 대통령 탄핵사건을 계기로 한국 좌파진영 내부에 존재하는 시대착오적이고 지극히 편협한 주사파 세력의 거짓된 선동정치가 대한민국의 근간을 흔들고 있다는 시대적 위기감에 재학생과 졸업생들이 시작한 포럼입니다. 자랑스러운 대한민국의 뼈대인 자유민주주의와 시장경제, 그리고 이를 바르게 조명할 수 있는 균형 잡힌 근현대사를 확립하고, 머지않아 도래할 북한의 해방을 대비하며 대한민국의 미래를 준비해 나가는 포럼이 되고자 합니다. 2018년 8월 현재 트루스포럼은 트루스얼라이언스를 구축하여 재학생, 동문, 일반인을 포함한 약 800여 명의 회원과 국내 70여개 대학의 회원을 확보하고 있으며, 대학 내 포럼, 스터디, 대자보 게시 등의 활동을 전개하고 있습니다. 트루스포럼의 기본적인 인식은 다음과 같습니다. 트루스포럼은 미국과 국제사회에 아래와 같은 성명을 전달합니다. 1. 대한민국은 주사파 세력에 점령당한, 위험한 상황입니다. 문재인 대통령은 민주화운동가/인권운동가로 알려져 있습니다. 하지만 문재인 대통령과, 대한민국의 민주화 운동을 일방적으로 찬양하기 힘든 이유는, 한국 민주화 운동 핵심에 북한을 추종하고 대한민국을 전복하려는 주사파가 있었기 때문입니다. 이들은 미국을 한반도 분단의 원흉, 자본주의와 제국주의의 앞잡이로 여겼습니다. 그리고 미국의 지원과 협력으로 세워진 대한민국을 부정했습니다. 문재인 대통령은 청와대 비서실장을 비롯한 비서진의 많은 수를 주사파로 기용했습니다. 북핵 문제가 심각한 상황임에도 불구하고 한미동맹에 균열을 내고 있습니다. 서독에서는 빌리브란트 총리의 최측근 보좌관이 간첩이었고, 베트남에선 대통령이 될 뻔한 야당 당수 쭝딘쥬가 간첩이었습니다. 많은 국민들이 한국에서도 비슷한 일이 발생하지는 않을까 우려하고 있습니다. 2. 우리는 강력한 한미동맹을 지지합니다. 자유와 진리를 향한 미국의 희생은 고귀했고, 헛되지 않았습니다. 미국은 한국의 혈맹이고, 한국의 놀라운 성공과 번영에는 미국의 헌신이 깃들어 있습니다. 우리는 자유와 진리의 가치 안에서 계속 함께 나아가야 합니다. 친북 좌파가 주도하는 언론 보도와는 달리 한미동맹을 훼손하고 있는 문재인 정권에 대해 많은 국민들이 분노하고 있으며, 대다수의 국민들은 강력한 한미동맹을 지지합니다. 주사파 정권의 거짓과 실정이 반복될수록 고귀한 한미동맹을 훼손하고 있는 문재인 정권에 대한 비난은 더욱 거세게 일어날 것입니다. 3. 북한의 실질적인 변화를 끌어내야 합니다. 북한의 실질적인 변화가 없는 평화협상은 의미가 없습니다. 북한 주민들의 고통은 지연되고 국제사회가 부담하는 핵위험은 증가할 뿐입니다. 우리는 이제 북한의 실제적인 변화를 끌어내야 합니다. 고통당하는 북한 주민들을 해방해야 합니다. 자유와 진리의 가치를 위해 함께 피 흘린 우리는 국제사회의 안녕과 북한의 변화를 위해 함께 나아가야 합니다. 4. 사회주의에 대한 지속적인 대응이 필요합니다. 우리가 함께 싸운 공산주의 소련은 망했지만 민주주의의 관용 아래 사회주의의 다양한 변종들은 여전히 우리를 공격하고 있습니다. 우리는 이에 함께 대응해야 합니다. 대한민국에서는 감상적 민족주의에 빠진 사회주의자들이 지상 최악의 노예국가 북한을 옹호하고 자유민주주의와 시장경제를 위협하며 반미감정을 조장해 왔습니다. 80년대 민주화운동을 주도한 그들은 노조를 통해 언론과 교육, 기업을 장악했습니다. 역사를 왜곡하고 언론을 통제하며 반시장적인 포퓰리즘을 퍼뜨려 왔습니다. 더 나아가 이들은 미국에서도 평화운동이라는 미명아래 활동하고 있습니다. 과거의 행적과 현재 추진하는 정책들을 고려할 때 우리는 문재인 대통령과 집권 여당이 이런 사람들은 아닌지 심각하게 우려합니다. 80년대 한국의 민주화 운동은 더 이상 맹목적으로 미화되어서는 안 되며 세심한 재평가가 필요합니다. 그리고 미국은 지금 한국 상황에 주의해야 합니다. 이 싸움은 우리가 공유하는 자유와 진리에 관한 문제이고 미국의 정체성과 가치에 직결된 문제이기 때문입니다. Truth Alliance is an alliance of Truth Forums of different universities in South Korea. The following is our statement addressed to the US and the international community. 1. The ROK is facing a dangerous situation due to the takeover by Juche ideology followers. 2. The majority of Koreans support a strong ROK-US alliance. 3. We must bring about substantial change in North Korea. 4. We must take consistent counteractive measures against socialism. 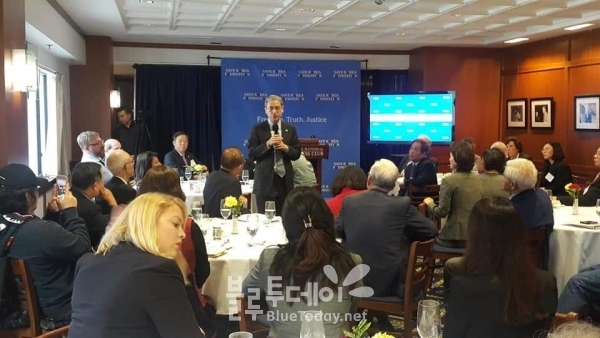 The first Truth Forum was founded by students and alumni of Seoul National University (SNU) in the spring of 2017 in response to the impeachment of president Park Geun-hye. With the impeachment of president Park in 2017, a strong sense of crisis was surfaced as anachronistic and illiberal political instigations of Juche ideology followers among the Left dangerously undermine the very foundation of the Republic of Korea (ROK). Many recognizing the seriousness of the threat joined SNU Truth Forum’s initiative, and other university students followed suit to form Truth Forums on their campuses. Truth Forums of different universities now work in solidarity as the Truth Alliance. As of August 2018, the Truth Alliance has over 800 members, composed of students and alumni from over 70 universities across Korea. The Truth Alliance is committed to establishing an objective and balanced contemporary history of Korea, which is essential for appreciating the values of liberal democracy and market economy which form the backbone of our proud ROK. The Truth Alliance is also committed to preparing for the future of the ROK where North Korea is liberated from its tyranny to enjoy freedom and prosperity with South Koreans. Truth Forums of different universities conduct various activities on campuses to this end, from hosting public forums and guest lectures to putting up posters on bulletin boards and organizing and facilitating study groups. 5. We respect Judeo-Christian values and tradition. The following is our statement addressed to the US and the international community. President Moon is known to have been a democracy activist and human rights lawyer. However, we must not uncritically applaud him and the democratic movement of the 1980s in Korea because Kim Il Sung’s Juche ideology followers (jusapa) that sought to subvert the ROK were at the core of that movement. They denounced the US as the archenemy responsible for the division of the Korean peninsula and the agent of capitalistic imperialism. Furthermore, they deny the legitimacy of the Republic of Korea established with the support of the US in 1948. President Moon appointed Juche ideology followers to many of the important positions in the Blue House, including his chief of staff Im Jong-seok, who was the most prominent jusapa member in the late 1980s. 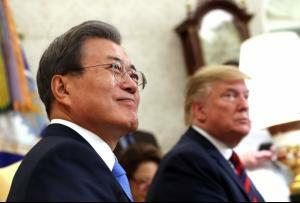 While the threat to the ROK and the international community by North Korea and its nuclear weapons is far from being resolved, president Moon is taking overt actions that weaken the ROK-US alliance. It should be remembered that in West Germany, Günter Guillaume, the secretary of the prime minister Willy Brandt was revealed to be a communist spy. So was Trương Đình Dzu, who nearly won the presidential election in South Vietnam. Many Koreans are concerned that South Korea is in similar circumstances. The sacrifice of American lives in the Korean War of 1950-53 to secure freedom from tyranny was noble and must not be forgotten. The ROK-US alliance is one forged in blood, and the US is ROK’s strongest ally. Korea would not be enjoying such remarkable success and prosperity without the support of the Americans. Korea and the United States must stand together, embracing the shared values of freedom and truth. 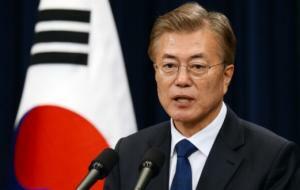 Contrary to what most mainstream media dominated by pro-North Korea Left reports, many Korean citizens are greatly angered by president Moon Jae-in for his undermining of the ROK-U.S. alliance. If the current jusapa administration's deception and maladministration continue, criticism against Moon Jae-in government for dishonoring the noble alliance will only grow louder. 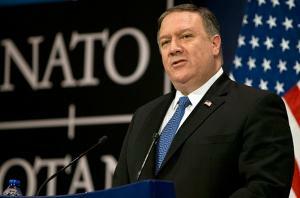 There is no point in having peace talks without bringing any concrete changes in North Korea. These talks for the sake of talks will only extend the sufferings of the North Korean people and the nuclear threat posed to the international community. We must now bring about substantial and tangible changes in North Korea. We must free those unjustly suffering North Koreans. The US and the ROK shed blood together to uphold freedom and truth. We must continue to fight the good fight together for the well-being of the international community and to bring changes in North Korea. The communist Soviet Union, which we fought against together, collapsed. However under the tolerance of democracy, different derivative forms of socialism are still threatening our values of freedom and truth. We must respond together. In South Korea, romantic nationalists have been advocating for the world's worst slave state of North Korea while threatening liberal democracy and market economy. They intentionally instigate anti-American sentiments. Those who led the “democratic” movement in the 1980s have gained control over the media, education system and businesses by dominating labor unions. They have been twisting and distorting history, controlling the media and spreading anti-market populism. Moreover, they are also operating in the name of a peace movement within the United States. We are gravely concerned that president Moon and the ruling party in Korea share these socialist views, considering the paths they have walked in the past and the policies the current administration is promoting. Korea's democratic movement in the 1980s should no longer be uncritically glorified and requires careful re-evaluation. The US must pay close attention to the Korean situation because freedom and truth - the values we share and the values that define American identity – are at stake.